The Announcement You’ve Been Waiting For: Fall Festival 2013! Yes. It’s here. Welcome Weekend. The fall semester. The start of a great year…and the announcement you have all been waiting for! So let’s cut to the chase. We are excited to announce that your Fall Festival 2013: Alumni, Student and Family Weekend lineup for Vibe Live is confirmed. Taking the stage on Saturday, September 28 will be Ke$ha, Sugar Ray and BonJourney! Last year nearly 6,000 students, alumni and their families filled Hofstra’s Intramural Fields for a day of fun and sun. 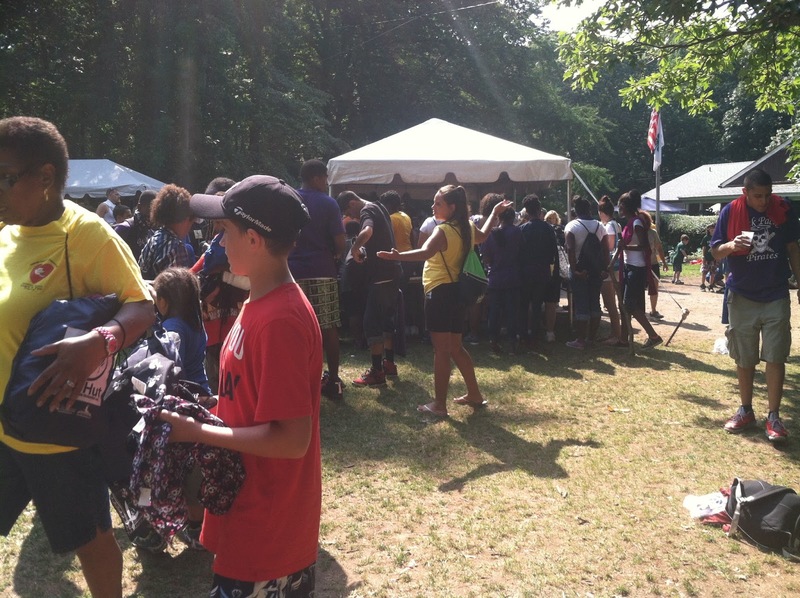 The Vibe Live Concert and Carnival will wrap up with a Grucci firework display. And as you already know, the evening is capped off with the Out Loud comedy show starring Aziz Ansari! Stay tuned and check your pride email accounts next week for more information on Hofstra Fall Festival 2013. Hofstra families and alumni can purchase tickets now! For the full schedule of events starting Friday, September 27 through Sunday, September 29, check out the Fall Festival website. For the past three days we have welcomed more than 350 students to our campus from 45 different countries. The Multicultural and International Student Office (MISPO) is excited to welcome our new international students to our Hofstra community. This year we had various activities in which the new students were able to settle in and learn what it is to be a Hofstra student. Their orientation consisted of an immigration review process and an immigration workshop, necessary for all international students. Then they were able to attend various sessions in order to understand our campus and know our services. In order to buy what they need for their new residence hall and purchase cell phones, they were able to go to our local shopping centers. Our office also hosted our first annual international student reception, in which all the new international students were welcomed to our community by the Provost Herman Berliner and Vice President of Student Affairs Sandra Johnson. A highlight of the program was the welcome to the students in multiple languages by our international student orientation volunteers. This year, we had 35 fabulous student volunteers helping with orientation with peer mentoring, leading activities, and building community with the group. MISPO thanks them for all their support throughout the orientation—their impact on creating a positive student experience is invaluable. 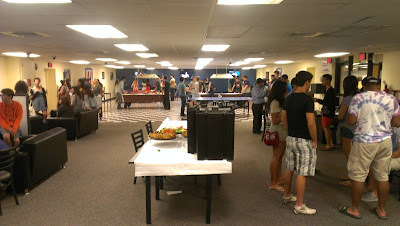 The last day of orientation concluded with the International Mixer in which the students enjoyed food and the entertainment of our game room in the Student Center. It was a great three days for our new international students and they are excited to be part of our Hofstra community. Our new students are from Austria, Bangladesh, Barbados, Belgium, Brazil, Canada, China, Colombia, Cyprus, Denmark, Ethiopia, France, Germany India, Iran, Italy, Jamaica, Japan, Kazakhstan, Kuwait, Malaysia, Mexico, Mongolia, The Netherlands, Nigeria, Pakistan, Peru, Philippines’, Poland, Portugal, Russia, Rwanda, Saudi Arabia, Serbia, South Korea, Spain, Sweden, Taiwan, Trinidad and Tobago, Turkey, Ukraine, United Kingdom, Venezuela, Vietnam and Zimbabwe. Outdoor Exploration had an amazing few days together! Their outdoor activities focused on leadership skills and self-discovery. Working together through their various icebreakers and high/low ropes courses our students created a very strong bond between one another. They were able to push past their first impressions and break down the barriers they all had around them to completely open up and learn to trust. 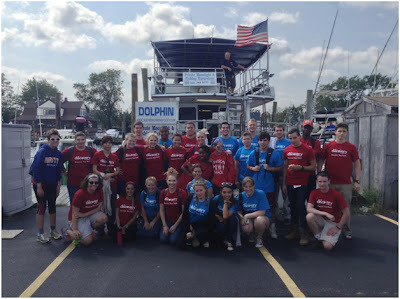 This unique group of young adults has found a sense of unity and respect for themselves and their new community. While completing their various daily challenges they were forced out of their comfort zones but were met with an overwhelming support system from everyone in the group. The time they all spent being unplugged from their usual daily lives allowed them to really connect and realize how similar their goals and fears were. Although there may have been times of uncertainty about how to tackle a challenge set before them, our students were completely prepared to work together to reach their goal. One specific activity, the night Solo Hike really caught the attention of the outdoor explorers. As they individually walked into complete darkness, single file and staggered in space, they entered into an unknown space, alone. Afterwards they reflected that although they were alone, they felt silently connected to one another, knowing that there was a connection between them. By being able to stay unplugged and focus on the tasks at hand, their ability to strike a connection between themselves was powerful and everlasting. These students have discovered themselves through one another, and will continue to do so throughout their time at Hofstra. The greatest part about their time spent together was that they all showed themselves as they truly are. They will make an everlasting impression on their university, and bring about a positive change to their new community. We take many aspects of our lives for granted. For example, our nice homes, caring and warm families, and even the very food we consume multiple times on the daily. Do we ever think about how important the simple item we hold in our hand is as we watch our daily dose of television? We eat and forget about it. We do not even think about what goes into our mouths. Forty-four percent of the entire earth’s population has to fight to get a single meal, and usually that meal doesn’t have nearly enough nutritional value needed to live. Today, we visited Homes for the Homeless and cared for children there. We made the children feel loved. We painted the walls of the shelter to make the place a little brighter, so that maybe their temporary home can actually feel like a home instead of a renovated motel. We sorted over two hundred and fifty backpacks so that the very children we played and talked with could go to school with the supplies they needed. Today we learned. We learned how to be grateful for every aspect of our lives. From the Hunger Banquet to the showing of The Pursuit Of Happiness, our experiences and the people leading us gave us a valuable lesson in never taking anything for granted. So be grateful everyone, because our lives are our gifts to us and we should never take anything for granted. At 6:30 am, while the sun was still hiding, fourteen grumpy Hofstra students rolled out of their beds and onto a bus bound for Wading River, NY. We were about to embark on what would become easily our most eye-opening day yet. 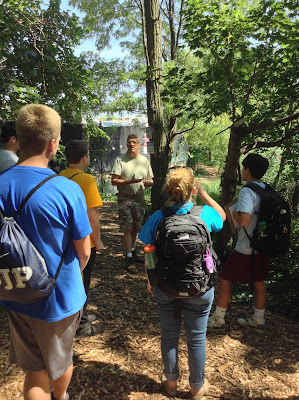 The social awareness path participated in an annual service project to create a summer camp experience for homeless and impoverished children. We arrived on site to be immediately thrown into the fray. Although the day had a rainy start, the arrival of the children brightened our day, and the weather soon seemed to follow suit. We swam, played Frisbee, hunted for treasure, listened to pirate stories, and did arts and crafts. The children were overjoyed and grateful. At the end of the day each child left with a book bag filled with new clothing and school supplies for the upcoming year. 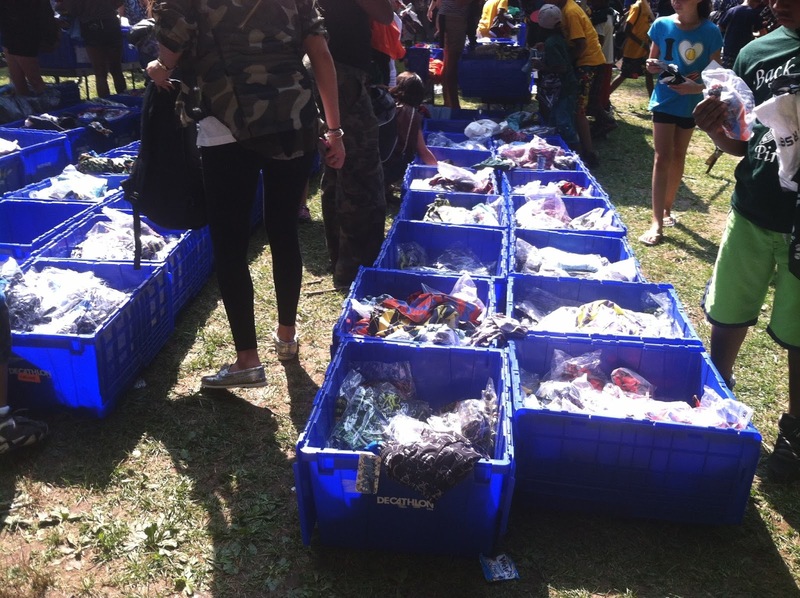 As we watched the children receive items, that we often take for granted, with joy and enthusiasm we were overwhelmed by the struggles that they face. We arrived back at Hofstra hungry and exhausted only to be confronted with another example of the harsh realities that many live within the world. The hunger banquet demonstrated the unequal distribution of resources in the world. 80% of the discovery program was subjected to eat nothing but a bowl of rice for dinner. We were both shocked and awed by how often we take for granted the food and resources readily available to us. At the end of the day we feel overwhelmed by our many realizations from today, but motivated by it in our goal to make a lasting difference for those less fortunate than us. Ready for another day on the job, our group quickly realized that today's tasks were not really tasks at all, but rather adventures. The schedule read fishing trip, and we were all excited to be out on the water on the south shore of Long Island with the outdoor exploration path. First mate Jon displayed his exquisite fishing skills, showing us all that it is possible to catch fish at a speed of approximately twelve fish per second. But seriously, he caught like twenty fish. Everyone else caught seaweed. No just kidding, most people caught a couple fish and some crabs. We had a great time and the weather was gorgeous. 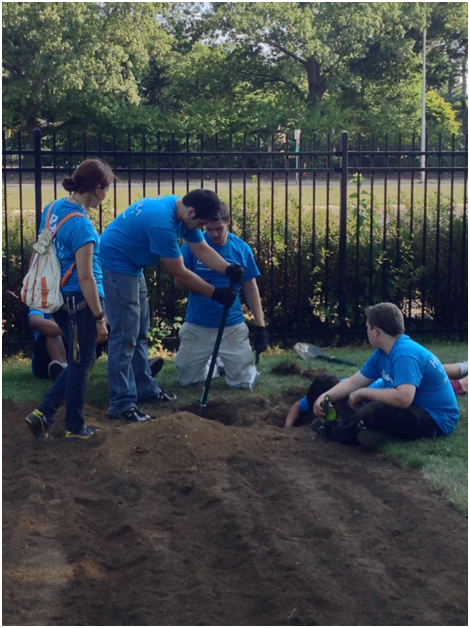 We returned to Stuyvesant, and engaged in a new activity: setting up the new student garden. The garden will be dedicated this Friday to our Hofstra hero Will Allen. We worked with the hope that we'll all have plenty of radishes for Thanksgiving. Day two of the Discovery Program was another great day! We were spread out all over Long Island and New York City continuing to explore our new home away from home. Each day we are learning new things, meeting new people, and becoming more acquainted with college life. Want to know what exactly what we were up to? Then keep reading! We are all heroes. From the patrons of the Interfaith Nutrition Network (INN) soup kitchen to the volunteers that serve them, we all share in our passions and sacrifices. However, the protagonists of this life story are truly those who spend the most time, do the most work, and have the most open hearts. Our new friends, our fellow volunteers at the INN were absolutely remarkable. Every one of them was kind and compassionate, and ready to do anything for the people they were helping. The house manager, Toni, stood out as the brightest. She positively glowed in her passion, and exuded energy. Her attitude brightened the very walls of the INN. She gave us knowledge and confidence in our work, and our day was only made sweeter by the many thanks we received from those we were serving. Not only did we cater food, but we prepared it, sorted donated clothes, household items, and school supplies for the boutique, where guests could gather what they needed for themselves and their families. There was a lot of work, and we made a definite dent for today, but it will all happen again tomorrow, and for many days to come. Many of us hope to go back and continue to make our mark, to grow and to learn. Once upon a time, at 7:30 am, fourteen Hofstra students with a thirst for social awareness ventured from noisy bus to smelly subway to arrive in New York City, only to leave the country entirely. 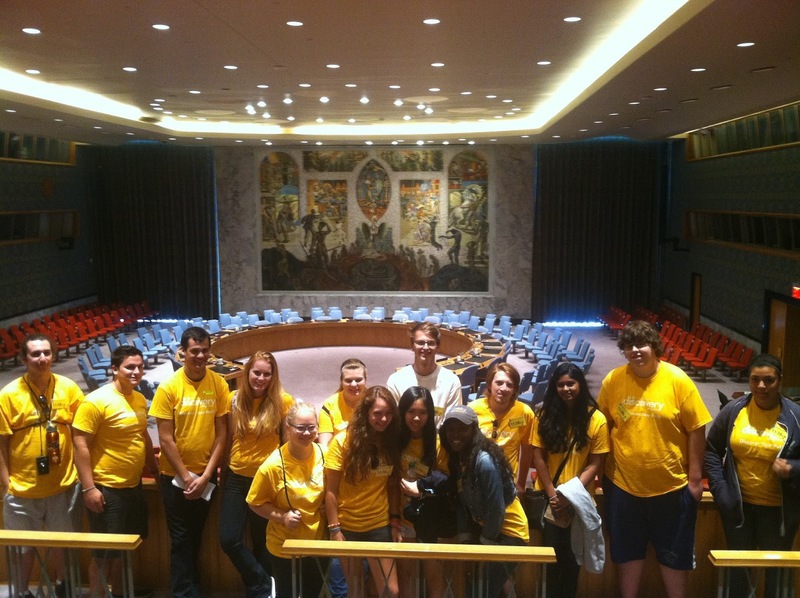 At the United Nations headquarters, we discovered that 193 countries have come together in hopes of creating international resolutions. There are 5 distinct councils that act like organs in the body of the UN. The councils promote everything from standardized traffic light colors to peace between nations and communities. We learned that “the UN was not created to take humanity to heaven, but to save it from hell.” After a delicious lunch, we trekked toward our next adventure: sorting, organizing, and preparing clothing donated to aid the former service men and women of New York City who are unfortunately unemployed. Although we did not interact directly with the veterans, we helped pave the path to success by helping to sort necessary interview appropriate apparel. As we finally began the journey back to Long Island we reflected on a fulfilling and informative day. The 2013-2014 school year has officially begun with the start of the Discovery Program! On Saturday new students moved onto campus early to participate in a dynamic, interactive program designed to help students transition to college through their experience and participation in advocacy, adventure, service and reflection. For these five days leading up to Welcome Week, students will be participating in various projects based on one out of four different paths of their choice. These paths are: Community Empowerment, Outdoor Exploration, Social Awareness, and Sustainable Solutions. This is the fifth year of the program and every year our students do amazing work as they begin to discover their path here at Hofstra. We will be updating you on the activities our paths are up to daily until the final the day of the program this Wednesday. At first, we did not realize how hard gutting a house would be. None of us had ever done anything similar before so this was definitely a new experience. Three All Hands volunteers, Geoff, Abigail and Heather aided us in all ways possible. Their knowledge exceeded ours and their guidance eased the process tenfold. The woman who owned one of the homes still lived in the house while we worked. Her kind and thankful words reminded us why we are participating in the Discovery Program in the first place. We reap the benefits of this experience as a whole, although it was messy to say the least. Hi. My name is Kilmer Merritt-Gawe. 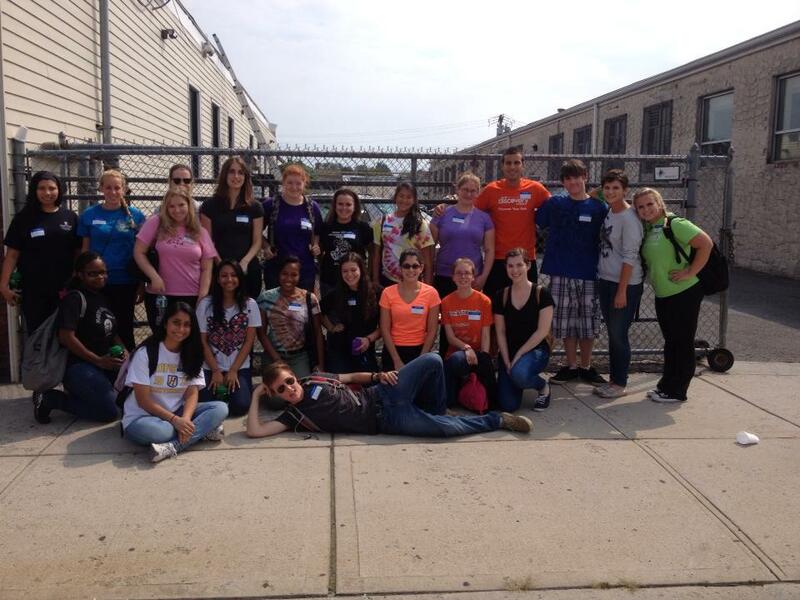 I am an incoming freshman at Hofstra University, and I have the honor of being a part of the 2013 Discovery Programs. I and fourteen other students are on the Social Awareness Path. Today was the official start of the program, and our first experience was a seminar given by a representative from the New York Civil Liberties Union (NYCLU). In the session we were presented with the tools to build better, stronger communities. Tools like the proper way to approach activism and learning the differences between and the importance of diversity, inclusion, and equity. It was amazing to see and to hear the dialog that was started because of this seminar. Many of us were pushed to think in ways we normally would not. And many of us were inspired to action. After this, we had a quick, enjoyable picnic lunch, and then we were off to our next project. Our next stop was volunteering at the local Food not Bombs hand out. 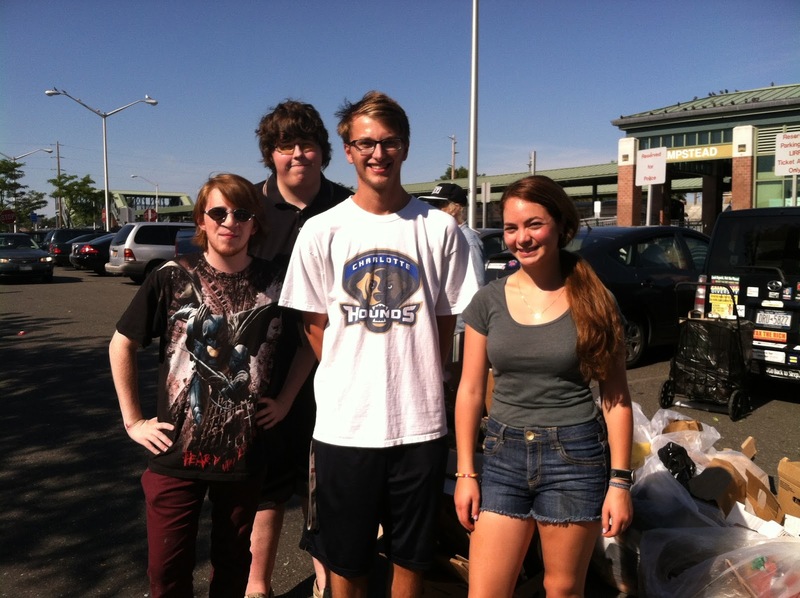 There we began unloading cars of foods, sorting numerous boxes, handing out much needed groceries. For many of us, this was an eye opening experience. All of us are privileged enough to send us to a private university. Poverty at that level was only something we had heard of in conversations and read of in newspapers. It was now very real. We were seeing everything we had learned about in the earlier session being put into practice. People saw a need. People went into action. And these actions have inspired many of us to return next to volunteer again. Overall, today was a good day for us. Today we discovered a lot. Bricks are heavy, mosquitoes are terrible, and digging holes is tough. We started out at the Garden City Bird Sanctuary, where we quickly divided into two groups of passionate, exuberant nature enthusiasts. Unaware of the day's tasks, we trudged off to pick up sticks and dig post holes. In the blazing sun, volunteers sweat profusely while planting gardens, digging holes, and weeding acres of run-down land affected by Superstorm Sandy and vandalism. Little did we know, we would soon be off to our second location at Manor Haven. At Manor Haven the volunteers were again divided to perform even more rigorous and exciting tasks. For example: one group picked up a thousand bottle caps, one group excavated a thousand pounds of brick, and one group hammered in a thousand nails. Overall, we had a demanding yet rewarding day which allowed us to discover ourselves in a way that we never imagined possible. And we smelled. Our first full day of activities was complete and while we were exhausted they we are still looking forward to the activities to come. Please check back tomorrow to see what we did! Hofstra Fall Festival Comedian Announced!